Last week I gave you a quick run-through on how I process new links: My Process for Adding New Links. This week I realized that there are a lot more tedious steps that I go through, so I thought I'd list them here to give you an idea of what it is like to maintain an index like Cyndi's List. Consider this: I go through each of the steps outlined below for every link that I add or update on Cyndi's List. Many times I do this a hundred or more times a day. Yes, my job is tedious. And no, there is no staff working for me. I have to confirm that the address given is correct. Sometimes incomplete URLs are submitted. Sometimes URLs are submitted with typos. Sometimes a URL is given that points to the top level of a site, but the link is actually intended to point to something deeper within the site. So, I have to search to find the correct URL for that deep link. If no description is submitted, I have to find one. With personal web sites, I like to have a description that includes 10-20 of the top surnames to be found on the site. If those aren't already included in the link submission I will do my best to find them and add them myself. I think having the surnames with the link make the search & find process easier for those of you who are browsing. If the text given in the description is repetitive or redundant I edit that out and strive to make the description as concise as possible. If the text in the description is too much of a "commercial" and has too much marketing buzz, I remove that. Instead, I focus on the available content when I edit the description. Sometimes I have to e-mail the submitter or owner of a site to get clarification. Titles on web sites give me fits every day. Sometimes there is no title on a web site. Sometimes there is a title in the body, but not in the Title tag (top of the browser window). Sometimes there is a title in the Title tag, but not in the body of the text. Sometimes there are multiple different titles in the body, in the Title tag, and in the link submission. At this point I'm usually pulling my hair out. I often have to treat multiple titles as if they are a title and sub-title. So, I include them both in my link title, separated with a hyphen. Remove extra unnecessary blank spaces. Insert blank spaces after commas or periods. Insert punctuation like commas or periods. Capitalize words that need it. Change capital letters to lowercase letters where necessary. Remove extra line breaks - all of my descriptions are just one paragraph. I have to determine the location for a web site in order to categorize it. Sometimes all that is supplied is a name of a cemetery, library or society, but not the location. I determine the country, the state/province, the county, the city/town/village. In order to do this I have to consult maps, gazetteers, and other online geography tools. Sometimes I have to e-mail the link-submitter or the owner of a site to get clarification. Sometimes web sites are in a foreign language. I use online translation tools to help me determine the purpose, title, and description of a site. Sometimes I consult with friends that have knowledge of foreign languages to get their help with determining specific information about the site. I often get duplicate link submissions. Sometimes people don't bother to check and see if the link already exists on Cyndi's List. Sometimes people think I won't notice that they are sending a duplicate, hoping for additional exposure for their link. Trust me, I notice. With a duplication, I generally check to see if I might need to update any of the addresses or descriptions for those links already on Cyndi's List. Every day I get dozens of link submissions that are just plain spam. The public never sees them. I delete them and send out a rather testy "reject" message. Sometimes I get links for sites that I know to be fraudulent, or to have participated in something fraudulent in the past. The public never sees these. Sometimes I get links for sites that are bordering on fraudulent and are just plain "iffy." I generally try to investigate the sites to determine who owns them, what genealogical content they actually contain, etc. If it doesn't feel right to me, I delete them. 255 people replied: 205 understand, 35 don't, and 15 want a text description. My purpose in asking the question was to help me determine how much work I really need to do when I write a description for a link. I had hoped that the green $ at the end of a link would make things so clear that I wouldn't have to do much more. But 13% of the people who responded don't understand the $, therefore I need to always clarify things in the written description for the links. And what does the little green $ mean? It means that the link points to a commercial web site that may charge a fee to use the site or to view certain search results and/or digitized images on the site. And no offense is intended toward my genealogy friends outside the United States by using the dollar sign. I assume it is a symbol that is widely recognized worldwide. Here's a quick walk-through of what I do when I work on adding a new link to Cyndi's List. Check to see whether or not I already have the link somewhere on Cyndi's List. I check to be sure the URL (address) is up-to-date. I check the title to be sure it is correct. I check the description to see if I need to add or edit anything. I check to be sure I have categorized and cross-referenced the link in the appropriate categories. Sometimes I find old links that need to be re-categorized since the last time they had been edited. I visit the web site. I check the URL (address) to be sure it is correct. I determine the correct title of the web site. I determine the purpose of the web site. I check and edit the description, if provided. If not provided, I find a quick description that I can use from the web site. I determine the categorization I will use for the site. This is based on the topic and any localities for the site. I will cross-reference the link under as many categories as are appropriate. For example, a web site for a U.S. Civil War regiment from Iowa will be categorized under "United States » Iowa » Military" and under "United States » U.S. Military: Civil War » Regimental Rosters, Histories & Records: The Union » Iowa"
If a location is part of the categorization I have to determine the country, state, province, and/or county. This often means using an online tool to help me place the link under the correct location. Once I'm done adding or updating a link it will appear in the daily What's New on Cyndi's List. The What's New is also sent out daily to the Cyndi's List Mailing List. Do you know of a web site that isn't yet linked on Cyndi's List? If so, Submit a New Link here: http://www.CyndisList.com/submit/. Please take the time to check Cyndi's List first and make sure the link won't be a duplicate submission. And, if possible, please submit a description for the link. For links that are submitted through the form on the site, each day I first look for any that are inappropriate, non-genealogical, or duplications. I delete those and the public never sees them. Every Saturday, for several years now, I drive to downtown Tacoma to take my son to his Tacoma Youth Symphony rehearsals (he plays the viola). As I get off the freeway I pass by the old Elks building—the local B.P.O.E building (Benevolent and Protective Order of Elks). I have the same thought every time I drive by: how sad that the building is empty, old, and rundown and the poor elk head has lost his antlers. There is a great photo of the front of the building here, 3rd photo from the top: http://kathrine-folieadeux.blogspot.com/2008/01/565-broadway-tacoma.html Click on the photo to enlarge it and see how the poor elk head hasn't well weathered the passing of time. 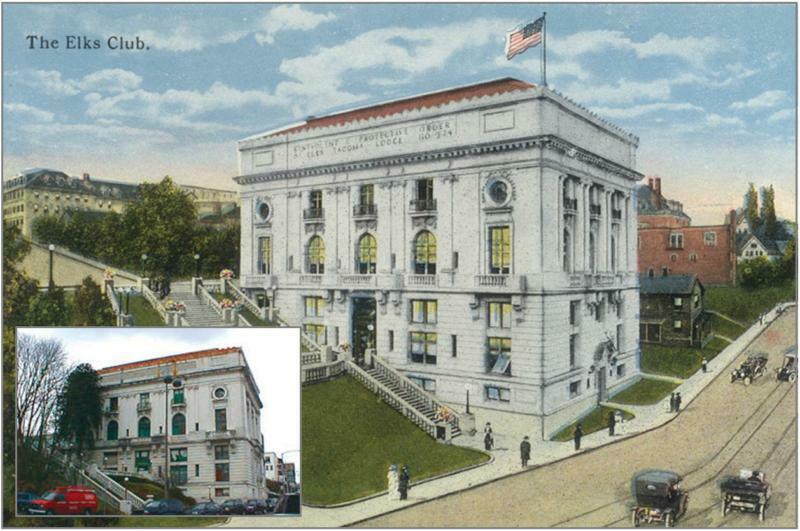 I found another image of an old postcard with a view of the Elks building: http://activerain.com/image_store/uploads/4/2/4/2/7/ar122673376572424.jpg. There is another building downtown that has an old neon sign that says something about the Pythian temple on it. Every time I see it I think I should remember to look up the history of the Pythian group, but I never remember to do it once I get back home. Today these thoughts reminded me to let you all know that I have a category on Cyndi's List for just this topic. The Cyndi's List Mailing List is a free, daily, read-only newsletter that reports my activity on Cyndi's List. Sometimes I take a day off, but in general I work on Cyndi's List 7 days a week. Every day I receive new link submissions and broken link reports from users of the list. I also have my own to-do list of links to work on. So, adding and updating links on a daily basis means that Cyndi's List is in a constant state of change. From the very beginning of the site in 1996 people wanted a way to find out what had been changed each day, so the Cyndi's List Mailing List was born. The mailing list receives two types of messages: personal messages from me when I have something I want to share, and automated messages from the Cyndi's List server. The other daily automated message on the CLML is the "Link Activity" report. The Link Activity report is intended to show subscribers where update activity has occurred on the Cyndi's List web site. The report details the number of new and updated links available by individual category and sub-category page, with a link to each of the updated pages. Genealogists with an interest in a specific topic or location can use the Link Activity report to find out when a category of interest should be revisited. Here is an archived copy of a typical Link Activity message: http://archiver.rootsweb.ancestry.com/th/read/CyndisList/2011-10/1318391104. In that example, you can see that the Australia-Military category had one updated link. You can click on the link to that category and look for the green "Updated" graphic to see what has been updated and whether or not it might be of interest for your research. If you haven't yet subscribed to the CLML, give it try. It is free and easy to subscribe to. Archived copies of the messages can also be browsed or searched. Every day as I work on Cyndi's List I have to determine how to categorize the links I'm adding to the database. I cross-reference the links in as many categories as are appropriate for the topic of the web site. In almost every case I will have to determine a geographic location for a link. In some cases this is easy to do. A good webmaster will clearly identify the location on the web site. For example, a web site for a cemetery should supply the name of the cemetery plus the city, county, state/province, and country in which that cemetery is located. To be very comprehensive the GPS coordinates might also be included, particularly for those country cemeteries that are out in the middle of a cow pasture. More often than not I end up with links that give partial location information. And many times I get links with no location supplied at all. This makes for a challenge when it comes to indexing the site. This can be just as frustrating for the researcher as it is for me. To aid me in determining a location within the United States I use the GNIS database interface supplied by the Yale Peabody Museum. GNIS is the Geographic Names Information System from the U.S. Geological Survey. You can also use their search interface here: GNIS Feature Search. I prefer the simplicity of the Yale Peabody interface, so it is what I will use in examples here. Today I had to categorize a link for "Cemetery Index, St. Mary's, Maryland." That is all the information I had from the title and the description given. So, I first indexed it under my Cemeteries category. I want to also index the link in the proper location under United States - Maryland. Using the Yale Peabody GNIS, I entered "St. Mary's" and chose Maryland and ANY FEATURE from the menus. I assume the lack of results I received might be because the query I was using was for "St. Mary's," which includes two items that the database might interpret different than I do: the abbreviation of St. instead of Saint, and the possessive apostrophe in Mary's. To simplify my query I did a search on only the word "Mary" taking out any St./Saint issue, and removing the possesive apostrophe. In the feature menu I also chose "cemetery" to help narrow down my search results. This time I had more success. The search resulted in six possible Saint Marys Cemetery hits. You'll notice that Saint is spelled out in the database and the apostrophe isn't there either. Keep this in mind for searches you do in the future, in this database and in others you find online. Now I have a new problem. Which of these six cemeteries, shown to be located in five different counties, is the correct location for my link? The only way to know for sure is for me to contact the web site owner and ask them. Most of the time using the GNIS database gets me the answer without having to go this one step further. The search results shown in the examples above show you six columns: 1) the name of the feature, 2) the type of feature, 3) the current county in which the feature exists, 4) latitude, 5) longitude, and 6) the name of the topographical map on which the feature can be found.